Confused about what meditation is or where to start? These action items will help you get going. The foundation to my success in sobriety and living a purpose-full, happy, healthy life is this: meditation. That’s it. It’s the core, the beginning, the little seedling from which all things grew. Take it away, and the rest crumbles. The one thing I recommend to anyone thinking about personal growth and change is to start to cultivate a daily meditation practice. I can’t say it enough. It is foundational to what you are building and the life you want to manifest for yourself. It is especially foundational to sobriety. Simply put, meditation is a practice that trains the mind. One of my spiritual teachers once said, “The mind is like a puppy. If you don’t train it, it shits everywhere.” Truer words may have never been spoken. Except an untrained mind is much more dangerous than an untrained puppy. An untrained mind is an untrained you. Western research tells us that we have some 70,000 thoughts per day. In yogic philosophy, the number is somewhere closer to 1,000 thoughts per second or something crazy like that. Whatever the number, it’s a lot of thoughts. With that much data processing, the untrained mind can only help but to hook onto some of those thoughts and run with them. This hooking onto thoughts takes us outside of ourselves, outside of our zone and away from our focus. It takes us down rabbit holes and tosses us into the wind like a balloon without a tether just waiting to catch the next thought that will float us some-where else. When we sit in meditation, we sit with this same massive downpour of thoughts coming at us, but we start to learn to unhook ourselves from them. We practice stilling ourselves, watching the thoughts as they pass by, and not giving ourselves over to them and tying ourselves to their mad journey. That practice of unhooking — over time — strengthens our ability to unhook in the real world, in our daily lives, when we are off our meditation pillows and in the crazy nonstop world. We learn to observe from afar and develop a discipline that allows us to consciously decide what to hook onto. We learn to create space. We learn to not react to everything. And — over time — the practice has exponential rippling effects. 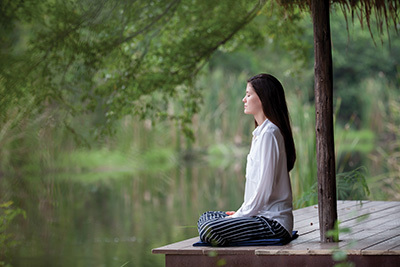 A meditation practice builds our parasympathetic response, strengthens the parts of the brain that focus, relieves anxiety, develops neutrality, promotes a sense of well-being and calm, changes our genetic structure, and, most importantly, changes us. And that’s the short list. If you’re intrigued and want to give it a whirl, here are six essential tips, including action items, to get you going. Like anything we do, we need to have some motivating factor to get us to start and keep us engaged. What got me started — long before sobriety — was a desire to get my mind to stop doing what it was doing — running the show like a freaky-deaky — without reaching for a glass of wine or a joint. That was January 2012. What engaged me to do it more was the freedom I began to experience from the hell that was my nonstop mind and seemingly unending anxiety. And what keeps me on my meditation cushion now are myriad reasons.